Congratulations, you’re ready to get your first inflatable raft or cataraft! It will open up a great new world of outdoor adventure to you. If you haven’t already made up your mind on the best choice of craft for the types of boating you plan to do, hopefully this article can give you some useful rules-of-thumb for choosing a boat that will fill your needs. First of all, like most things in life where you have to make choices, there’s no one size or type of boat that’s perfect for every kind of use. Life, and boat selection, is just full of compromises. That’s why you see some of us boating addicts with a “quiver” of different boats. Your goal is to pick a boat that is excellent for your most important use(s) and, hopefully, adequate for more secondary ones. How many people do you want to carry? What is your prior experience with inflatables? What types of boats have you been on? What kinds of boats do others use on the waters where you plan to boat? Day-use only, or if for multiday trips, how long and how many people do you want to take? Paddle the boat, row it, or want to do both? The larger the boat, the more people and gear it can carry. Duh! The smaller the boat, the more nimble and maneuverable it will probably be and the more exciting the ride in whitewater. However, if you overload that smaller boat, you may well find that it’s less “nimble and maneuverable” than a larger boat with the same weight load. If you’re planning to paddle it on day trips, figure that a 12-13 foot raft is comfortable for a maximum of five-six people and a 14-15 footer will work well for up to seven or eight folks. For R-2ing (paddling with just two people), stick to a 12-foot or smaller raft. For multiday trips, you take just about as much gear for an overnight as you do for a week. The difference is primarily in the food, beverages and water needed. If you are a minimalist, willing to go more “backpacker-style”, you don’t need as much gear, cooler and drybox space as the “everything, including the kitchen sink” crowd. 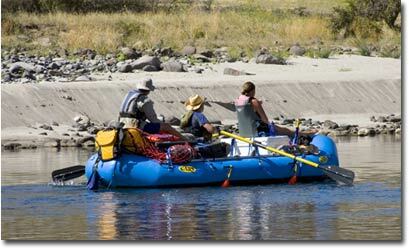 For multiday trips, of say up to seven days, for two people, figure on at least a 13-foot raft or 13-14 foot cataraft. For three or four folks, you’re looking at a 14-15 foot raft or a 16-18 foot cat. 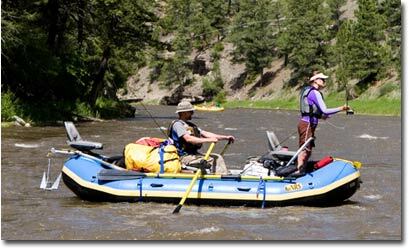 If you’re planning on taking on big water, in say the Grand Canyon, you will probably want a 14-16 foot raft or 16-18 foot cataraft. While the tubes of a cataraft are lighter than a self bailing raft of equal length (there’s more material in the raft), the frame of the cataraft will generally be heavier (there’s necessarily more structure needed to solidly secure the cat tubes). When you have a crew of people that paddle the boat, everyone gets to participate in the experience of making it happen. However, the members of the group have to be physically capable of executing the paddle strokes. When you put a frame on a boat and row it, you have complete control of the craft. This allows you to take people of different physical abilities, or who just want to be passengers. The wider the boat, the more stable it will be in whitewater. A narrower boat can fit through tighter rocky stretches. The distance between the side tubes of a raft or cataraft (dictated by the frame) determines the size of cooler or drybox that will fit inside. A wider raft doesn’t necessarily have more interior room. If the boat has larger diameter tubes, that eats into this space. Properly loaded, they tend to be more nimble and maneuverable than rafts. Properly and lightly loaded, a cat makes a fun play boat. They usually can take longer frames than rafts of the same length, thus have more room for gear. Their open design makes them less susceptible to headwinds and instantly “self bailing” in rapids. It’s easier to mount an outboard motor to a cat. Cat tubes and frame are generally cheaper than a raft and frame, of comparable load capacity and quality. That extra room makes it easy to overload a cat. Distribution of weight, fore and aft, is more critical in a cat, to get maximum performance. It’s not practical to use raft paddles to propel a framed cat. Cats aren’t as passenger friendly; it’s harder to move around on one. Unless you put a floor on a cat, if you drop something, it’s gone. Having a floor makes it easier to load gear. Weight distribution isn’t as critical for good performance. You can paddle a raft, with a crew where each has a single bladed raft or canoe paddle, as well as row it. Passengers can sit on perimeter tubes and inflated thwarts. That, plus the floor makes them more passenger-friendly. Rafts are more kid-friendly, they can move around more freely. More surface area on the water gives greater weight carrying capacity than a comparable length cat. With gear tending to be piled higher and the upturned bow and stern tubes they’re more susceptible to wind resistance. More surface area on the water can make them less maneuverable than a cat. 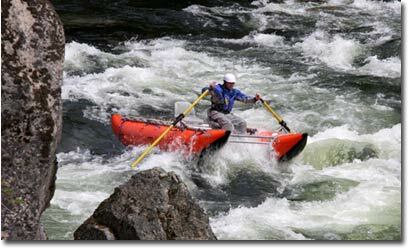 The large bottom area can stop or stall a raft in a rapid that a cat would punch through. A raft will hang up on a shallowly submerged rock that a cat can “straddle.” However, when a raft and cat of the same length are loaded with the same weight, the cat tubes will set deeper in the water. It would take a book to thoroughly cover all the ins and outs of choosing a boat. Hopefully, this will help you narrow down the choices. Give us a call, 800.635.5202, and one of our friendly, knowledgeable Customer Service Reps can help you further. We enjoy talking about boats! And, as always, we welcome your feedback, write us at editor@nrs.com.